Keith R. Mueller’s Journey to the Black City unravels two thousand years after the world as we know it has come to a devastating and shocking end. Human civilization has perished in the face of a war between two powerful countries forced to deal with a destructive Ice Age. Human population has been further decimated by a deadly influenza virus and while some survivors congregate together in a few city states, others choose to roam as Free Tribes in the forest amidst wild animals like wolves, sabretooth cats, and mammoths. Kel grows up in a small tribe with his future as the tribe’s shaman assured. He is about to marry Lyria, a girl from another tribe, whose extraordinary visions brought her to the care of Garn, Kel’s grandfather and the shaman of the tribe. Events take a different turn when their tribe is raided by agents from the Black City and Garn is kidnapped. As Kel and Lyria make the perilous journey to the Black City to rescue Kel’s grandfather, they are about to face a priesthood whose lust for power and wealth is insatiable. Journey to the Black City presents to us a novel about the likely world to come after wars, an Ice Age, and diseases have decimated our cities and set in motion strange changes on the societal level. If there is a Black City that rises from the ashes of world destruction, it seems inevitable that a power hungry institution will take advantage of the situation and the result is a moral minefield as shocking as it is a real possibility. But what makes Journey to the Black City doubly interesting is the contrast between magic and science, tribal practices and modern life. The nightmare of the Black City is that its inhabitants have lost their humanity. 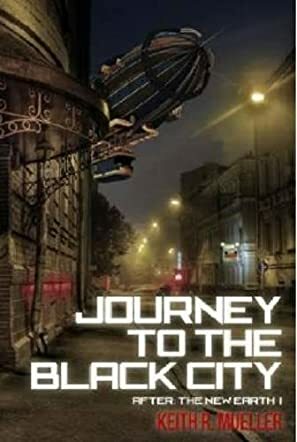 Keith R. Mueller’s Journey to the Black City is an ambitious and well written novel and it certainly provides endless possibilities for debate. Ending on a cliff hanger, there is a suggestion or the possibility of a sequel and I am certainly looking forward to it!